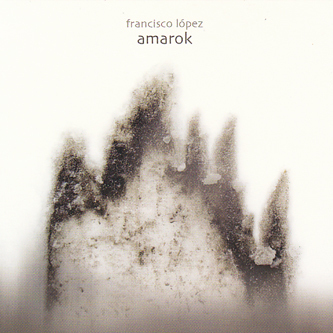 For those yet to discover Francisco Lopez's vast discography, Amarok represents a brilliant way in. While not necessarily any more or any less accessible than material you'll hear elsewhere in his catalogue, there are ties between this mammoth hour-long piece and the language of dark-ambient music. You'll have to crank the volume a little bit to appreciate the scale and dynamic range employed here, but once you've acclimatised the Spanish composer soon immerses you in an icy drone-grotto, booming with low end presence and ground-melting rumbles while a biting arctic wind circulates. The piece's name, Amarok, is derived from a giant wolf in Inuit mythology. Aptly, at one stage you hear a snarling, heavy breathing rise up from the backdrop, sounding like a field recording of some terrifying cave beast, which by Lopez's very studious and level-headed standards almost comes across as a bit campy, but in this context such noises fit in with the bleak polar atmospherics of the piece. In addition to Lopez regulars, fans of Thomas Koner and Deathprod would do well to ckeck this out. Highly recommended.